Fatah delegation to visit Cairo in an attempt to resolve longstanding conflict with Hamas. A Fatah delegation will visit Cairo within the coming days in an attempt to resolve the longstanding Fatah-Hamas conflict, sources told i24news on Tuesday. A member of Fatah’s central committee, Azzam al-Ahmad, welcomed the ongoing efforts on the part of the Egyptian government to end the factional dispute. Hamas and Fatah have been at odds since 2007, when Hamas violently took control of Gaza in a bloody coup, and all attempts to reconcile the sides have failed. A unity government between the sides collapsed in 2015 when Fatah leader and Palestinian Authority (PA) chairman Mahmoud Abbas decided to dissolve it amid a deepening rift between the sides. The tensions have escalated recently after Hamas established an administrative board tasked with running the day-to-day affairs in Gaza. The move has escalated tensions between Hamas and the PA, which recently finally acknowledged that it has no control over Gaza and has been trying to force it to return control of the enclave by creating economic pressure on the group. These measures include the cutting electricity supplies to Gaza through Israel and the halting of salary payments to more than 30 lawmakers affiliated with Hamas. 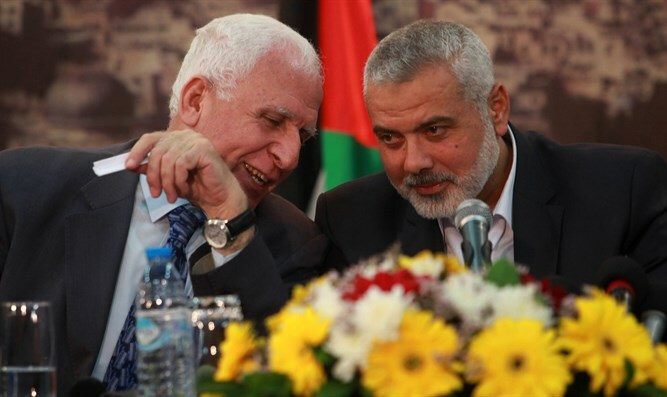 On Monday, however, Hamas politburo chief Ismail Haniyeh expressed a willingness to begin talks with Fatah following meetings with senior Egyptian officials.